Linksys Wi-Fi Routers and older versions of Linksys Smart Wi-Fi Routers are designed to be set up with the Linksys Connect Software. But in some cases, the router is set up manually without using the software. This means that Linksys Connect will have to be synchronized with the settings of the router to use the other features that the software has. QUICK TIP: You may also contact your third-party firewall manufacturer to learn how to disable its features. NOTE: In this example, the setup for the Linksys E3000 is used. Insert the Setup CD on your computer’s CD drive then click Run. NOTE: For Mac® computers, locate and double-click the icon. Then, locate and double-click on the Setup/Connect icon. This should start the Linksys Connect installation. The Linksys Connect Software should run automatically as soon as the setup CD is inserted into the CD drive of the computer. Otherwise, click here for information on how to start Linksys Connect manually. QUICK TIP: If you lost your setup CD, click here to download the Linksys Connect Software instead. 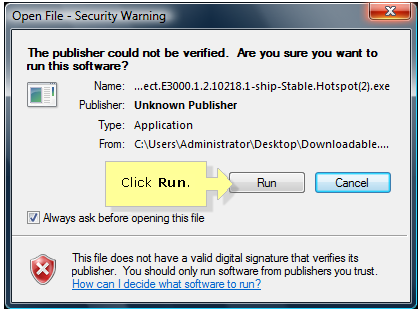 Read the Software End User License Agreement and click Next. Click Next after doing the given detailed instructions on how to connect the power cable and the modem to the router. You will receive a prompt that your router has already been set up. 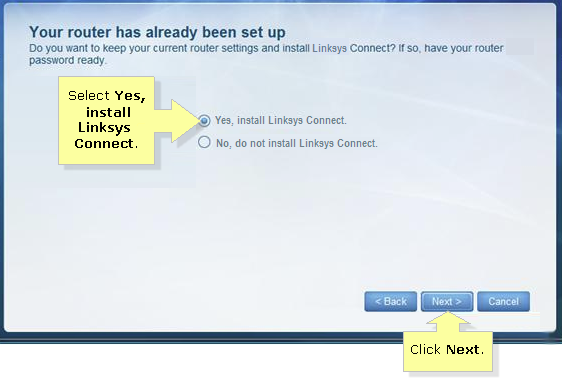 Select Yes, install Linksys Connect and click Next. On the Enter your router password screen, enter the router password in the blank field provided and then click Next. NOTE: Enter “admin” as the default router password. However, if you have changed the router password when you manually set it up, enter it instead. QUICK TIP: If you have forgotten your router password, you may need to reset your router to factory settings. This will allow you to configure your router with Linksys Connect after the installation of the software. To reset the router, press and hold the Reset button for 10 seconds using a pen or a paper clip then unplug the router from the power outlet for 30 seconds then plug it back in and wait for the Power LED to be solid. After resetting the router, set up your router with Linksys Connect. To learn how, click here. You will then be prompted that you are already connected to the Internet. Click OK.
Click Done on the Linksys Connect main menu to finish the installation. Your router’s wireless settings are already synchronized with the Linksys Connect Software. Your router has the capability to connect multiple devices in the network such as smartphones, game consoles and printers. If you have a large house with devices that require top wireless speeds and a wide range, you can also extend the range of your wireless network by using other networking devices from Linksys such as the Powerline adapters. To know more about Powerline adapters, click here.